These materials can be ground up and used as aggregate in concrete or as road base. We can legally haul up to 10 tons. These loads may not include trash, vegetation (including roots), plastic liner, wood, etc. 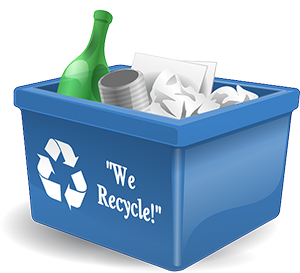 The unwanted materials may result in a clean-up fee that may be more than the original agreed upon price; these materials may also result in the load being treated as a trash load which may double the recycle price. Tree trimmings and yard waste are ground up and used as mulch. No paint, varnish, stain or other treatment of the lumber. No composite lumber such as plywood or fiberboard. The glue used in these products make them non-recyclable. No metal hardware such as hinges, elbows, bracket, etc. Metals can be recycled as long as they are free of trash. We charge a haul rate and refund or credit your account for the proceeds of the metal sale (supported by a copy of the recycler’s receipt). Mixed metals usually receive a lower price per ton than separated metals. Sod is the top layer of grass, roots and incidental dirt. Sod may be recycle if there is no trash.